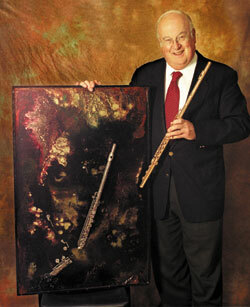 Professor of Flute Michel Debost is often asked why, in 1989, he left Paris for Oberlin. After all, following studies at the Conservatoire de Paris, he had established an illustrious, international career in the French capital, winning ­ by the time he was 30 ­ every major flute competition there is to win. He had succeeded his good friend (and his son's godfather), the late Jean-Pierre Rampal, as Professor of Flute at the Conservatoire. Indeed, Debost recalls as favorite moments from his performing career Verdi's Requiem with Herbert von Karajan, any concert with Charles Munch, and Mozart operas with another good friend, Daniel Barenboim ­ all former music directors of the Orchestre de Paris, where Debost served as principal flutist for 20 years. Why on earth leave all this for Oberlin, which is, as everyone knows, flat? He gave a very simple answer once to an American reporter: "The part of Ohio where Oberlin is, OK, it's flat, OK there's countryside, but I was looking for that and I found a lot of riches here." These riches include a new jewel in Debost's stateside crown, the Lifetime Achievement Award for Significant, Lasting Contributions to the Flute World, presented in August 2001 in Dallas by the National Flute Association (NFA) at its annual convention. At Oberlin, with his wife of 35 years, Teacher of Wind Chamber Music and Flute Kathleen Chastain, Debost oversees the summer Oberlin Flute Institute, an annual program that attracts more than than two dozen American and international high school and college students. Aside from two children, the Debosts have two grandchildren, with another on the way. A consulting editor for the magazine Flute Talk, Debost writes a regular column. And in 2001, the English language version of his acclaimed book Une simple flute (The Simple Flute) was published by Oxford University Press. His many awards include a Grammy nomination for his Telemann duets with James Galway. Each year he tours his adopted country as a soloist - he will perform in Tempe, Arizona in March 2002. He also has international engagements on his schedule, including Curitiba, Brazil in January, and Porto, Portugal in May. In March and in May, audiences in France and Hungary will be able to see him perform Leonard Bernstein's Halil. Debost, who is 68 years old, says that he presents an annual recital in Oberlin "just so people know that despite my very large age, I can still play the flute a little." Notable Debost students from Oberlin include Molly Barth '97 of eighth blackbird and Claire Chase '00, winner of the 1999 Presser Music Award. In 2001, five of Debost's current students made the semi-finals round at the Jean-Pierre Rampal International Flute Competition. Debost recently settled in over coffee and a plate of hummus at the Java Zone for a little "flute talk." How much importance do you place on the winning of awards? Do you think that awards are important? MD: Oh yes, sure. It's a credit, of course. But it's the same with great appointments and great decorations and things like that. The previous day, you're not more stupid than the day of the event and the next day after that, you're no wiser. How does it feel to receive a Lifetime Achievement Award? MD: Mixed blessing. It means that you cannot go any higher. I don't take it very seriously. Why did you decide to teach? And, after all, why Oberlin? MD: I have to make a living. But I came to Oberlin to do it because after playing 30 years in an orchestra, I wanted to retire, and this is a great school. I was happy to be appointed to a good teaching position and be in contact with young people who have a future. You also taught at the Conservatoire while you were with the Orchestre de Paris. Do French students differ from American students? MD: No longer. They did at one time. The '70s changed a lot of things. The relationship between the professor and the student in France used to be really formal ­ much more formal than here. In France, you never, never, ever questioned what the master said. Whereas in America it's always been the tradition to disagree sometimes. That's actually seen as a positive thing from the student's part. Was that difficult to adjust to once you started teaching here? doesn't bother me. I think ­ and my students understand this ­ that by refusing to do some things, as some students do, they're not showing intelligence as they think they are; they're just missing out on learning how to do something they don't feel they should. I often tell them: Once you pass the door, you do what you like. But here you do what I'm asking you, not because it's right ­ which sometimes it is ­ but because by doing something that doesn't come naturally to you, you learn something about yourself and your art. What is the best age for a student to begin learning the flute? MD: As soon as the limbs and fingers are long enough to play without stress. Are there any pieces that students should hold off learning because they might be too challenging? MD: Yes, I definitely think so. This is a vice of the American teaching system. There are students who are playing the mainstays of the repertoire (Shubert variations, the Prokofiev flute sonata, Bach sonatas, the Mozart concertos), and they're just not mature enough to play them ­ instrumentally and musically. They develop bad habits that they cannot fix if they learn pieces too soon. You have no idea the trouble these students have, correcting faulty hand position, faulty way of playing the notes. It's a serious problem. Young students should start out on some of the "cheapo" romantic flute pieces. There are a million of them. Like Boehm. Or, what they called in the early 1900s, conservatoire pieces. MD: Never separate the instrument from music. You have to practice technique and instrumental playing with a musical idea, but you cannot play music properly without instrumental knowledge. It's a two-way street. A lot of students say, 'I didn't come here to do this or that,' and 'I want to play this; I don't want to play that.' This is not a good approach. Students should learn about technique with a musical idea and should play music with technical solutions. Not everybody agrees with that. Rather than recalibrate your approach from student to student, each student needs to recalibrate to you? MD: My concern is to make students efficient players with what they've got. I used to think you can mold people. You cannot. It's like relationships. For them to work, you have to accept the other person as he or she is. Why so many marriages fall apart is we all want to change the other one. That's just not the way. With the students it's the same thing. I think you don't change them, but you orient them differently and make them think about themselves and make them know how things will work. There are so few seats for flutists in orchestras. What practical advice can you give to students as they begin to craft their careers? MD: That's a big question because there are maybe, the world over, 100 professional orchestras, so that makes about 400 to 500 flute players, and there are a lot of candidates. Even among the 100 orchestras in the world there are only about 20 that are desirable for most of these students. But the advice I give them is to do the best they can and not think about how somebody else is going to make the grade instead of them. Eventually they will find their niche as a teacher or in an orchestra. Are those students of yours who don't find a seat in an orchestra able to find opportunities to perform? MD: There's quite a lot of opportunity to play chamber music. But mostly students create the opportunities for themselves. It's really their responsibility. My idea? I say do everything. Try everything. Competitions here, all over the place. Everything you do is good. What is the value of competition for a young musician? MD: The value is in knowing about him or herself. You learn about yourself by preparing, absolutely. But a lot of students say, 'Oh, I don't want to do it. It's all fixed ahead of time.' It's not true. Every day there's somebody who gets discovered. You have to do everything. In the closing chapter of my book I say, 'Do everything. If you succeed you're no better than when you fail. And when you fail you're no worse than when you succeed.' Just do it. Turn the page, say bravo, and go on.